Catalog Page 48. 6" & 8" Thrifty Bears and Dogs. Inexpensive stuffed animals. Catalog Page 48. 6" and 8" Thrifty Bears and Dogs. Inexpensive stuffed animals including teddy bears and dogs with custom printed t-shirts for sale. 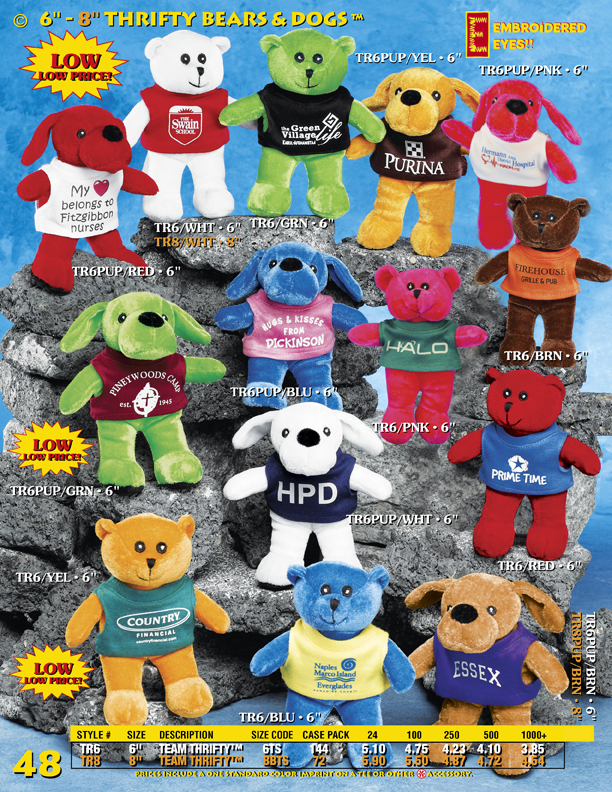 These are low-priced personalized teddy bears with the printed t-shirt or accessory included. These Thrifty bears are the lowest priced personalized teddy bears that we offer. Although the master cartons can be packed with 144 pieces per box, you can order any quantity you want. You can also mix and match animal colors or shirt colors within the same family at no additional charge. These are very popular and affordable stuffed animals.